This article is about the section of Interstate 10 in Arizona. For the entire route, see Interstate 10. First section completed in 1960; Last section opened in 1990. 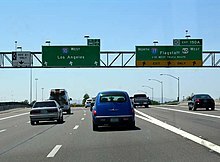 In the U.S. state of Arizona, Interstate 10 (I‑10), the major east–west Interstate Highway in the United States Sun Belt, runs east from California, enters Arizona near the town of Ehrenberg and continues through Phoenix and Tucson and exits at the border with New Mexico near San Simon. The highway also runs through the cities of Casa Grande, Eloy, and Marana. Segments of the highway are referred to as either the Papago Freeway, Inner Loop, or Maricopa Freeway within the Phoenix area, and the Pearl Harbor Memorial Highway outside metro Phoenix. The western terminus is located at the California border at the Colorado River in La Paz County where I-10 continues westward into California towards Los Angeles. Here, the same physical road is signed as both I‑10 and U.S. Route 95 (US 95). The highway runs east by northeast past Ehrenberg and Quartzsite and then turns to an east by southeast orientation just before the junction for US 60. It continues this path entering Maricopa County and the Phoenix Metro area. The route turns east by northeast again at the junction for State Route 85 (SR 85) northwest of downtown Buckeye, and turns due east at Verrado Way (exit 120). Here, the speed limit drops from 75 to 65 miles per hour (121 to 105 km/h). The landscape by this point is largely urban. From there, I-10 traverses through the communities of Goodyear, Avondale and Tolleson, meeting with local streets and area freeways such as the Loop 303 Estrella Freeway (at the former Cotton Lane interchange, exit 124) and the Loop 101 Agua Fria Freeway along the way. By October 2018, the simple diamond interchange with 59th Avenue (exit 138) will have been totally rebuilt, transforming it into the first of three junctions with Loop 202 (here known as the South Mountain Freeway). As it makes its way through Phoenix, the highway meets with I‑17 and US 60 for the first time just northwest of downtown at The Stack. East of The Stack, I-10 forms the north edge of downtown. Near 3rd Avenue, the highway enters a half-mile tunnel (800 m) that runs under a park and the central branch of the City of Phoenix Library. Emerging past 3rd Street, the highway continues due eastward for another 2 miles (3.2 km) before coming to another interchange for Route 51 and Loop 202 (second of three junctions with the latter), called the Mini Stack. At this interchange, I‑10 turns southward for about 3 miles (4.8 km), passing near Sky Harbor Airport and reaching the second junction with I‑17/US 60. Here, I‑17 terminates as I‑10 skews eastward again. After this junction, the highway is co-signed with US 60. Continuing southeast over the Salt River and eastward, I‑10 and US 60 enter Tempe and meets with SR 143. Then, at the Broadway Curve, the freeway turns southward again, with US 60 splitting off to become its own freeway. I‑10 continues southward running along the city borders of Phoenix on the west, and Tempe, Guadalupe, Tempe again, and finally Chandler on the east. Immediately north of the Gila River Indian Community, I‑10 has its third and final intersection with Loop 202. Past Loop 202, the highway turns to a more south by southeast direction going through the Gila River Indian Community and entering Pinal County. As of a 2006 estimate, the Broadway Curve portion of I‑10 in Tempe carries an average of 294,000 vehicles per day. This number is predicted to increase by over 150,000 to approximately 450,000 by the year 2025. This section of I‑10 is currently twelve lanes wide, and is the widest section of freeway in the valley. A study is underway to determine whether widening the Broadway Curve to double its current width to twenty-four lanes is feasible. After exiting the Phoenix metropolitan area, I‑10 continues southward into Casa Grande intersecting I‑8 before heading southeast towards Tucson, paralleling the Santa Cruz River. Several projects have occurred recently, including construction of a new exit at Twin Peaks Rd in Marana and widening of I‑10 from Prince Rd to I-19 in Tucson to four lanes in each direction, which was later extended to Ruthrauff Rd/El Camino Del Cerro. After I-10's junction with I-19, I-10 heads southeast towards Benson and Willcox before entering New Mexico. I‑10 in Arizona was laid out by the Arizona Highway Department in 1956-58 roughly paralleling several historic routes across the state. Particularly east of Eloy, it follows the Butterfield Stage and Pony Express routes, and loops south to avoid the north–south Basin and Range mountains prevalent in the state. In fact, the route from its junction with I‑8 east to New Mexico is almost exactly the same route used by the old horse-drawn stagecoaches, which had to go from waterhole to waterhole and avoid the hostile Apache Indians. This is why I-10 is more of a north–south route between Phoenix and Tucson than east–west. The Southern Pacific Sunset Route line had to take the route of least hills, and in the 1920s highways were laid down next to the trains across southern Arizona. When the project was being designed in the 1950s, the Arizona Highway Department fought for a nearly straight-shot west from Phoenix for the new freeway, instead of angling northwest out of Phoenix along US 60/US 70/US 89, through Wickenburg. Wickenburgers battled to bring the freeway through their city but lost that battle. The detour up through Wickenburg was logical decades earlier, when nearly all U.S. highways through Arizona were laid out along railroad tracks, and US 60/US 70 was routed mostly parallel to the Santa Fe rail tracks east of Wickenburg, and the Arizona and California Railway west to Vicksburg. The two old federal routes then struck west across the desert and state line, picking up the Southern Pacific mainline at Indio, California, and I-10 overlies the old roads most of that distance. Moving east from the California line at Ehrenburg, I-10 follows the old route of US 60/US 70 for the first 31 miles (50 km) east from Blythe, California. In 1960, this western-most stretch of I-10 was built from near the Colorado River east to the future spot where the "Brenda Cutoff" section of I-10 would connect a decade later. Until the early 1970s, this was the last freeway stretch until Phoenix. The "Brenda Cutoff" was named for a gas station on the old road just east of the fork where US 60 now terminates at I-10. Now an obscure name, "Brenda Cutoff" was the working title that the Arizona Highway Department called the stretch of freeway from US 60 to near Buckeye. The Brenda Cutoff paralleled old sand roads used in the 1920s for Phoenix-Los Angeles traffic, but mostly abandoned after US 60/US 70 was built to the north, through Wickenburg. The Brenda Cutoff's opening on June 18, 1973 was eagerly awaited and was a big deal in newspapers in Phoenix and Los Angeles. It saved motorists from having to drive through Glendale, Sun City, Wickenburg and Salome, about 20 miles (32 km) out of the way, and it eliminated about 80 miles (130 km) of two-lane highway. But the freeway was opened only as far east as Tonopah, and heavy traffic was routed down narrow county roads through the desert and fields between Tonopah and Buckeye. In addition, there was only one very-small gas station on the very-long route between Buckeye and Quartzsite, on the old county road at the tiny crossroads of Palo Verde. Signs warning "No Services Next 106 Miles" were posted at either end of the Brenda Cutoff those first few years. The freeway was extended past Tonopah as far east as Phoenix's western fringes (at Cotton Lane) in about 1974. I-10's freeway section ended in Goodyear until the controversial Papago Freeway was finished across the western Valley of the Sun in 1990. During the "west valley gap" years, westbound I-10 traffic was routed off the Maricopa Freeway at 19th Avenue in Phoenix, and stayed on the access road as it curved past the Durango Curve. Los Angeles-bound traffic then turned left on Buckeye Road and followed the "TO 10" signs down Buckeye Road (first marked US 80 until 1977, then SR 85) for nearly 15 years. The interstate's route through Phoenix was hotly contested in the 1960s, 1970s and early 1980s. A plan proposed by the Arizona Department of Transportation involved monstrous block-sized 270-degree "helicoil" interchanges at Third Avenue and Third Street that would connect motorists to freeway lanes 100 feet (30 m) in the air, but voters killed it in 1973 as a result of opposition from the Arizona Republic newspaper and a growing nationwide anti-freeway sentiment. Voters on election day were treated to a photo depiction on the front page of the newspaper that in later years was shown to have drastically-overstated the freeway's height, but there is no question the proposed viaducts and helicoils would have been a visual gash across central Phoenix. Beginning in 1961, a stub of what is now the Inner Loop portion of I‑10 was built northward from the Maricopa Freeway (then I‑10) along 20th Street, ending 1⁄2 mile (800 m) north at Buckeye Road. This stub was originally designated I-510. The Inner Loop name was given to it in 1969, at which time the highway changed numbers, to I-410. The I-10/I-510 interchange was the first multi-level interchange in Arizona and lasted until the Inner Loop was built as a real freeway in the 1980s. This putative freeway was two lanes in each direction and would have been hopelessly inadequate as a leg of the Inner Loop as it was intended. After 1973, Arizona engineers favored a more-modest plan to link I-10 with I‑17 at the "Durango Curve" near 19th Avenue at Buckeye Road, and avoid the "Moreland Corridor" alignment of the Papago Freeway by adopting a route south of Buckeye Rd. In 1983, ADOT unveiled the current below grade plans on Moreland Street, three blocks south of McDowell Road. Despite some local opposition, I-10 was finally completed in central Phoenix on the Inner Loop alignment, 3⁄4 mile (1.2 km) north of Van Buren Street, on August 10, 1990. The state is now considering a reliever freeway in West Phoenix, parallel to I-10 on the old Durango Street corridor, and was originally designated as Route 801, which has since been changed to SR 30. The original 1962 alignment of I-10 through Phoenix was on the Black Canyon and Maricopa Freeways, now signed as I-17 and US 60, starting at about Grand Avenue. From 1962-74, I‑10 in Phoenix ended at 40th Street, and truck traffic through Phoenix and Mesa was directed to use Arizona Route T-69 via 40th Street south and Baseline Road east to connect to SR 87 and SR 93, the shortcuts to Tucson. The I-10 signs were moved from the Maricopa Freeway to the Papago Freeway/Inner Loop alignments when it opened in 1990 - the last gap of I-10 to be completed between Santa Monica and Jacksonville. This was the only time in Arizona where the posted freeway was moved from one road to another: the state never posted Interstate signs on older state or U.S. highways. ADOT instead made frequent use of interstate shields with the word "TO" above and arrows below the shield. For several years in the early 1970s an orphan section of I-10 was opened between Baseline Road and Williams Field Road (now Chandler Blvd.) but was not marked as any highway, nor was it connected to the rest of the Interstate Highway System. ADOT, it seems, did not want to divert trucks down from T-69 in Guadalupe down into the cotton fields west of Chandler. This section got its interstate signs when the freeway south to Tucson was completed in about 1970, and the "Broadway Curve" was connected a year or so later—for almost two years, I-10 traffic used Baseline Road and 40th Street through the Japanese flower gardens until the last link between Tucson and Phoenix opened in about 1972. From 1958-1972, the interstate was unmarked south from Tempe and Mesa, and traffic used either SR 87 through Coolidge or SR 93 through Casa Grande, or US 80/US 89 through Mesa and Florence. I‑10 signs reappeared at the town of Picacho, the 1962-1970 western terminus of the freeway from Tucson. I‑10 was widened from Verrado Way to Loop 101, a total of 13 miles (21 km). This included a new HOV lane from Dysart Road (Exit 129) to Loop 101, later adding a HOV lane from Estrella Pkwy (exit 126) to Dysart Road. From Estrella Pkwy to Verrado Way, an additional lane was added. New interchanges have been added, whereas Citrus Road has a new exit at 123 and Sarival Avenue has a new exit at 125. The road from Casa Grande to Tucson was originally SR 84 and SR 93, and when it was rebuilt as a freeway in 1961-62 it was cosigned as I‑10 and routes 84 and 93 through 1966, when 84 was truncated at Picacho. This section of interstate was completed in 1961, and forced the demolition of the town center at Marana, which has never really recovered. The freeway through Tucson, which was rebuilt and widened in stages from 1989 to 2014, with frontage roads added, was originally signed as SR 84 from Miracle Mile to Sixth Avenue. The original highway from Casa Grande to Tucson entered the Old Pueblo via Miracle Mile, a road modeled after German Autobahns but without overpasses or an exclusive right of way. Traffic circles at either end of Miracle Mile were the best Tucson could come up with in 1937. The section of Miracle Mile West stretching between Miracle Mile and the Southern Pacific overpass was signed as Business Loop 10, SR 84A and SR 93 in the 1960s. It is now marked as the southern leg on SR 77, the new designation for US 80/US 89 north out of Tucson. The Business Loop designation was dropped in 1998. The present-day I‑10 alignment along the Santa Cruz River was laid out after a city bond issue passed in 1948 to build a riverbank-side boulevard with room for a four-lane freeway in the median to follow. The first section of bypass artery, from Congress Street north to Miracle Mile West, was opened in 1954 but had no overpasses or interchanges at Grant Road, Speedway Boulevard or St. Mary's Road. The freeway was finally built after the state took over the bypass and promised it interstate status in 1958, and parts of it obliterated the original road. It was first signed SR 84. The old cloverleaf at Sixth Avenue was the first built in Arizona, opening in the early 1950s as a southern Tucson gateway junction to the roads linking Tucson, Benson, Nogales and the hoped-for Tucson bypass along the Santa Cruz River. It was converted to a diamond interchange by 1964 and the old "quick dip" underpass was removed and replaced by an interstate-standard overpass in the late 1980s. Although the controversial I‑10 route across Phoenix was the last gap of I‑10 to be completed, two pieces of the interstate were subsequently left sitting on divided remnants of old US 80 and were neither built to interstate nor modern safety standards. One was the old Sixth Avenue interchange, and a small section of freeway east to the overpass over the old Southern Pacific (now Union Pacific) spur to Nogales and Guaymas. That section was replaced about 1990. The last section of old US 80 that carried the I‑10 traffic was an underpass beneath the Union Pacific mainline east of Tucson, where the freeway median shrank to a guardrail at Marsh Station Road and the Pantano railroad overpass was too low. The Marsh Station Road interchange was replaced in 2011, with the railroad mainline rerouted in 2012 and the railroad overpass removed in 2013. The remainder of the old US 80 section was rebuilt to interstate standards, with completion in 2014. East of Tucson, I‑10 parallels and in some cases overlies old US 80 to Benson, and was originally co-signed as US 80 and SR 86. The section of I-10 from Valencia Road to Rita Road was the first construction project in the state of Arizona funded by the Federal Aid Highway Act of 1956. Construction began in 1957 and was completed in 1960. From Benson, the Interstate follows the Southern Pacific mainline east through Willcox and Bowie to New Mexico, rather than bend south to the Mexican border along old US 80 (signed as SR 80 after 1989), through Douglas. The road from Benson east through Willcox was designated SR 86 in about 1935, that route number was subsequently shifted west and exists now between Why and Tucson. The bypass around Benson was opened about 1979, and other than the Phoenix gap was the last section of I‑10 to be opened. The Arizona Department of Transportation in 2008 conducted a feasibility study of building new bypass freeways around Phoenix and Tucson and "straighten" I‑10 across the state. One route would have gone roughly from Buckeye east to Florence, then east through mountainous terrain to the Sulphur Springs Valley and connect with the existing I‑10 near Bowie. But this new roadway would traverse some environmentally fragile areas and was opposed as a gateway to urban sprawl. Another studied alignment would bypass Tucson to the south, forming a looping bypass freeway from Marana through the Avra Valley to Green Valley to Benson, an alternative that is still being studied. 414.58 257 Speedway Boulevard, St. Marys Road – University of Arizona No westbound signage for St. Marys Rd. 416.26 258 Congress Street, Broadway Boulevard, St. Marys Road No westbound signage for Broadway Blvd., no eastbound signage for St. Marys Rd. 426.04 264 Palo Verde Road, Irvington Road Signed as exits 264A (south) and 264B (north) eastbound. 426.99 265 Alvernon Way Signed as Alvernon Way North (westbound). Westbound traffic to Alvernon Way South use exit 264 (Irvington Road). ^ Arizona Department of Transportation. "ADOT Highway Log" (PDF). Retrieved July 16, 2007. ^ "State proposes an additional 10 lanes for highway". East Valley Tribune. Archived from the original on May 2, 2008. Retrieved March 18, 2008. ^ "202 foes love new Broadway Curve". Arizona Republic. Phoenix. Retrieved March 18, 2008. ^ "Extension may help uncork Broadway Curve". Arizona Republic. Phoenix. Retrieved March 18, 2008. ^ Breyer, Joe. "Arizona DOT Right-of-Way Resolution 1962-151". Arizona Highway Data. Works Consulting, LLC. Retrieved March 6, 2016. ^ Breyer, Joe. "Arizona DOT Right-of-Way Resolution 1969-016". Arizona Highway Data. Works Consulting, LLC. Retrieved March 6, 2016. ^ "The Way It Was in 1956". United States Department of Transportation. Retrieved April 13, 2008. ^ Harelson, Hugh (December 4, 1960). "$3 Million Road Budget Explained". Arizona Republic. Phoenix. p. 17. Retrieved October 6, 2018 – via Newspapers.com. ^ "Federally Aided Road Improvements Begin". Arizona Daily Star (Morning ed.). Tucson, Arizona. March 26, 1957. p. 1. Retrieved October 6, 2018 – via Newspapers.com. ^ "2012 ADOT Highway Log" (PDF). ADOT. Arizona Department of Transportation. December 31, 2012. pp. 11–78. Retrieved May 17, 2015. ^ "Historic Arizona U.S. Route 80 Designation". Tucson Historic Preservation Foundation. August 2017. Retrieved September 30, 2018. ^ Shell Oil Company; H.M. Gousha Company (1956). Shell Highway Map of Arizona (Map). 1:1,330,560. Chicago: Shell Oil Company. Retrieved March 31, 2015 – via David Rumsey Map Collection. ^ DMJM Harris; AECOM (September 2007). Interstate 10–Hassayampa Valley Roadway Framework Study (PDF) (Report). Maricopa Association of Governments. ch. 6. Retrieved September 12, 2018. ^ "I-10 TI Construction: Avondale at Fairway Drive". Arizona Department of Transportation. Retrieved February 23, 2018. ^ O'Dell, Rob (July 9, 2008). "Aviation Parkway extension route OK'd; Rio Nuevo is moving ahead". Arizona Daily Star. Tucson, Arizona. Retrieved December 23, 2015. Wikimedia Commons has media related to Interstate 10 in Arizona.